This delightful combination of fresh strawberries, JELL-O and COOL WHIP is sure to become a new family favorite. Add boiling water to gelatin mix in large bowl; stir 2 min. until completely dissolved. Stir in cold water. Place strawberries in 6-cup mold; cover with 2 cups gelatin. Refrigerate 30 min. or until gelatin is set but not firm. Meanwhile, refrigerate remaining gelatin 30 min. or until slightly thickened. Whisk in 2 cups COOL WHIP until well blended. Spoon over gelatin layer in mold. Refrigerate 4 hours or until firm. Unmold. Serve topped with remaining COOL WHIP. Good news! You can save 60 calories and 1 g of fat per serving by preparing with JELL-O Strawberry Flavor Sugar Free Gelatin and COOL WHIP LITE Whipped Topping. Prepare as directed, using JELL-O Orange Flavor Gelatin and chopped mangos. 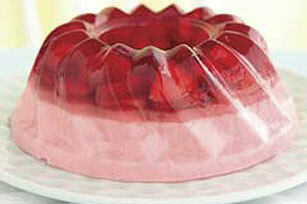 If you don't have a 6-cup gelatin mold, you can prepare dessert in a 1-1/2-qt. bowl instead.